You are here: Home » Artful L.A.
L.A. museums get a bum wrap. While researching things to do there, I noticed message board commenters often recommended that out-of-towners take in the city’s museums before immediately adding a caveat. Almost by way of apology, it seemed, they would note that the museums were worth a visit “but” weren’t as impressive as those in other cities like New York. While it’s true that many museums fall short in a head-to-head with New York’s legendary Metropolitan Museum of Art, Los Angeles has plenty to offer art lovers. Here are three museums well worth a visit…on their own merit. And in addition to impressive artwork, both the Getty Villa and the Getty Center have an added bonus that Manhattan museums do not: Pacific Ocean views. 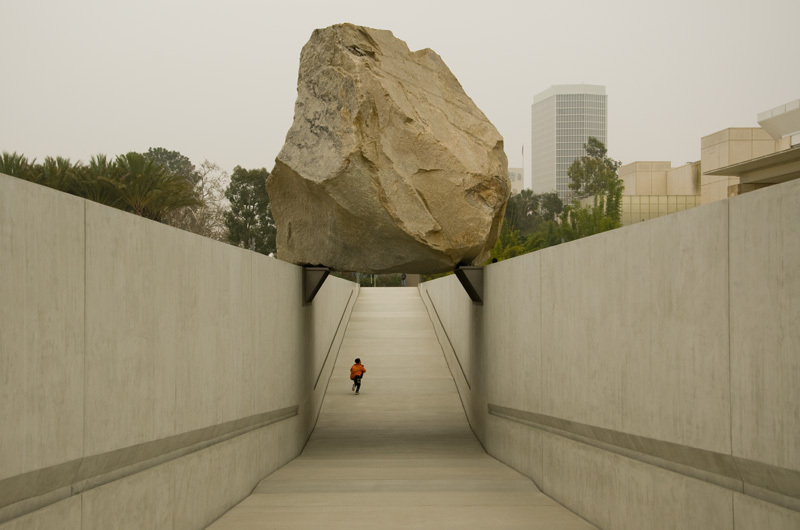 The much-hyped outdoor sculpture Levitating Rock isn’t nearly as interesting as what’s inside the Los Angeles County Museum of Art. The largest art museum in the western U.S., the LACMA is home to 100,000 objects dating from ancient times to the present. 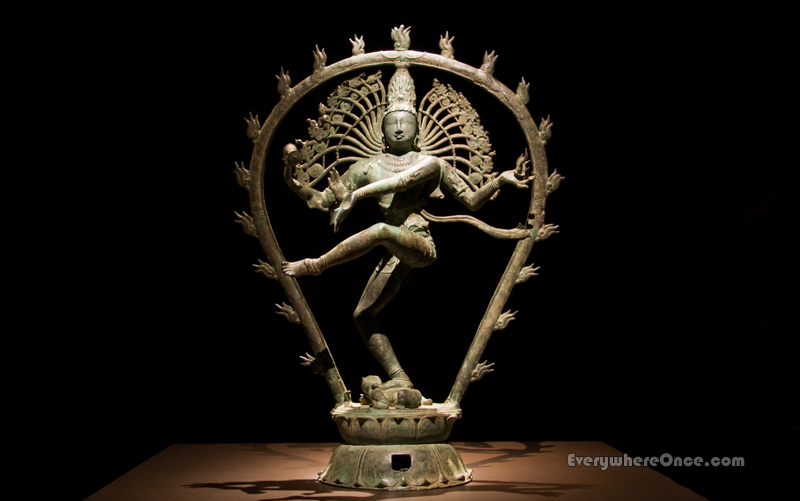 Particularly impressive is the collection of South and Southeast Asian Art, which ranges from a sixteenth-century painting that once hung in a Tibetan monastery to a bejeweled dagger wielded during India’s Mughal empire. 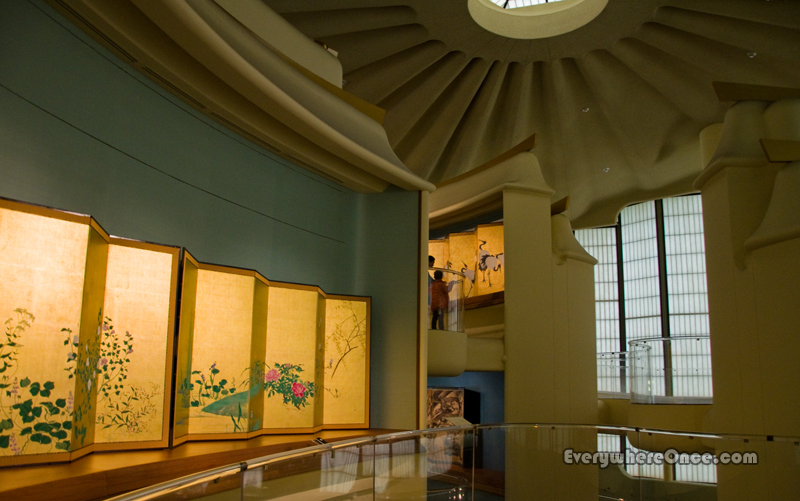 Another highlight is the unusual and elegant Pavilion for Japanese Art. The multi-story gallery is explored via a spiral walkway that winds past colorful, hand-painted scrolls and other decorative objects. After reading Yxta Maya Murray’s novel The Conquest, the Getty Center in Los Angeles was added to my list of must-see sites. Murray describes the museum’s hilltop location overlooking the city, the tram visitors ride to reach the summit, and some of its treasures—like Edvard Munch’s Starry Night, a tranquil, vastly different work than his famous painting The Scream. Colorful history lessons sometimes come with the art. 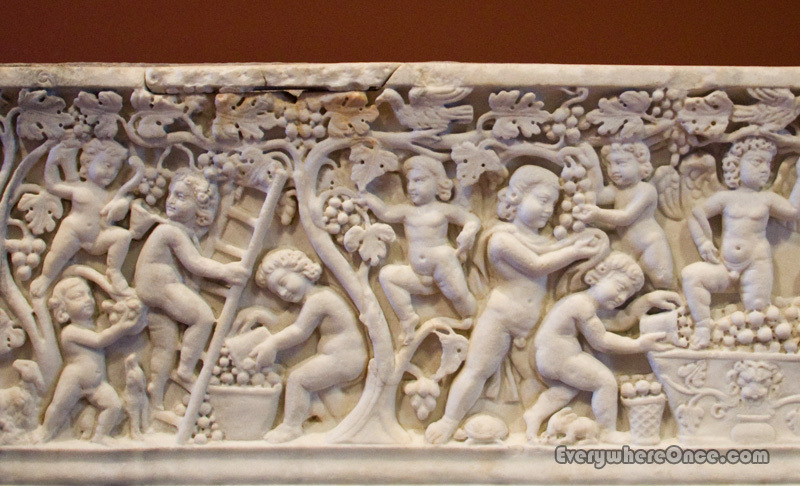 Among the items on permanent view is a sarcophagus circa A.D. 290-300 that depicts a celebration of a grape harvest. It’s displayed in a room with other wine-related objects and an explanation of the role of wine in ancient times. Offered to deities and lauded for its curative properties, wine, declared the Greek poet Panyassis, “is the gods’ best gift to mortals…. It drains all the troubles from men’s hearts.” Although too much merriment was frowned upon. It was considered barbaric to drink wine that wasn’t mixed with water. Diluting it lessened the possibility that the wine god Dionysus (and Bacchus, his Roman counterpart) would encourage rage and folly. Looking at the Getty Villa, I was thinking of having my backyard done out like that but I wouldn’t want people to think I was just copying. Ha. No worries, though. 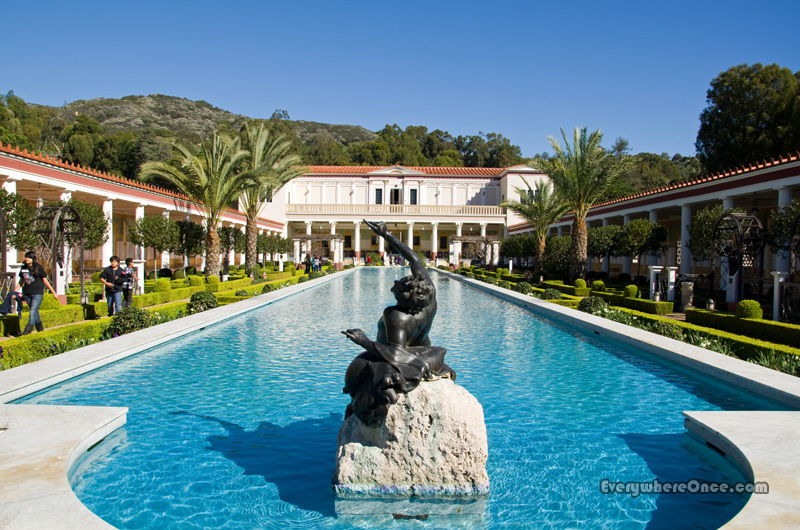 The Getty Villa is itself patterned after a first century Roman country house. It looks like art in LA is worth a visit! The fact that so many LA museums have great outdoor areas is one of the things I love about them. 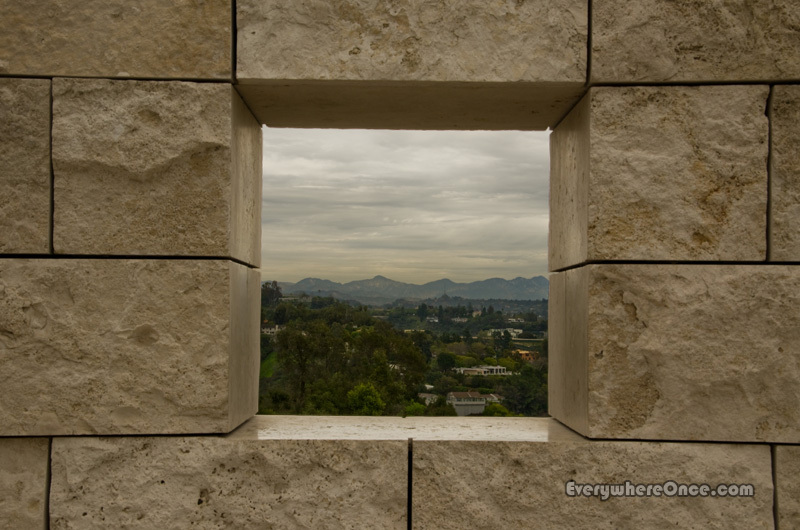 Yeah, the Getty Center is great for that. I totally agree – we visited the Getty Villa on our last trip to California and fell in love with it – best docent led tours I’ve ever been on. They give you these headphones to wear so you can hear the docent even as you wander around seeing other things. Great experience. 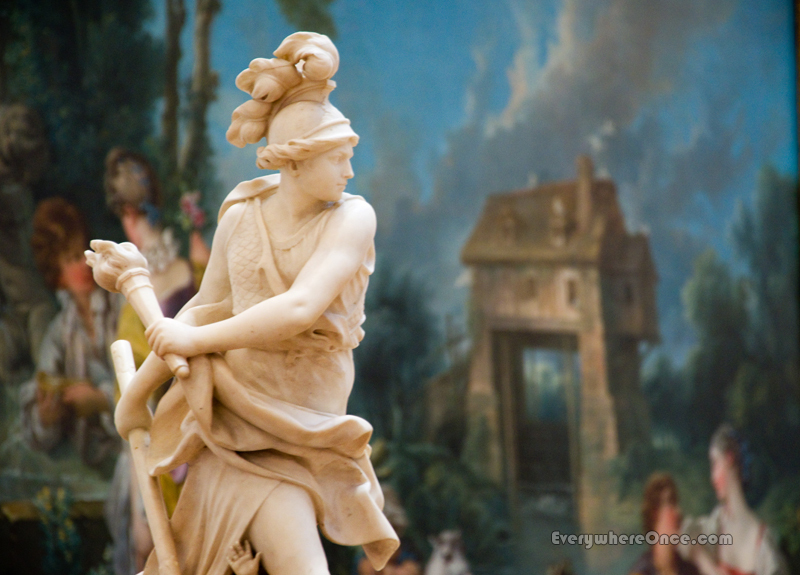 We usually skip structured tours and the Getty Villa was no exception. Most of the time that ends up being the right call, but it sounds like we missed out at Getty. Bummer. The Museum of Tolerance was on our to-do list but never got checked off. Something for next time. 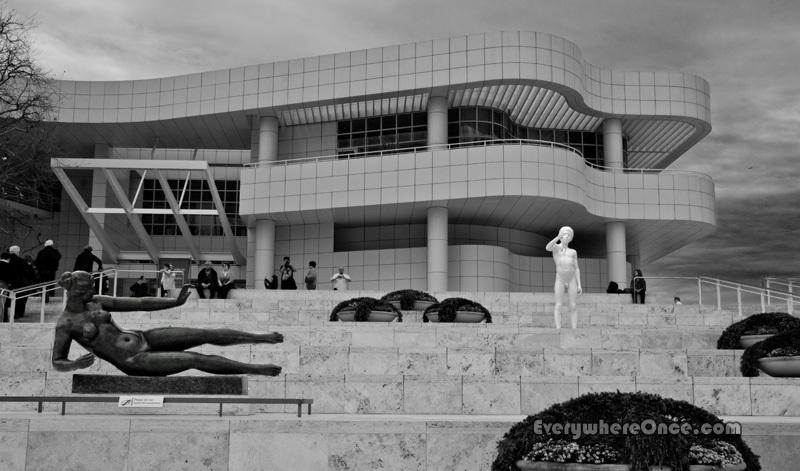 I’ve been to the Getty Center, don’t remember the year, but it was shortly after it opened. My kids got a little antsy, but it is a cool place. We’re going up there in a couple months maybe we’ll put a museum on our list.